Are you searching for Insulation Options For New Homes or New Home Construction Insulation Contractors? If so, this guide should help you understand the different types of insulation better and get an idea of which insulation option you should choose. Next, we feature the top 5 insulation options for new home construction. Cellulose insulation is mode out of fluffed and shredded newspaper. It contains 15% environmentally safe fire retardant mineral compounds and 85% recycled material. Cellulose can be sprayed on wet or Blown-in dry. It costs about the same as fiberglass but has a higher R-value. Cotton insulation has R-value of 3-4 per inch covered while fiberglass insulation has R-values in the 5-6 per inch range. Cotton insulation isn’t as effective as fiberglass and you will pay 15-20% more to install it. Although, most homeowners who are in to green building are more likely to install cotton because it’s more of an environmental friendly type of insulation material. 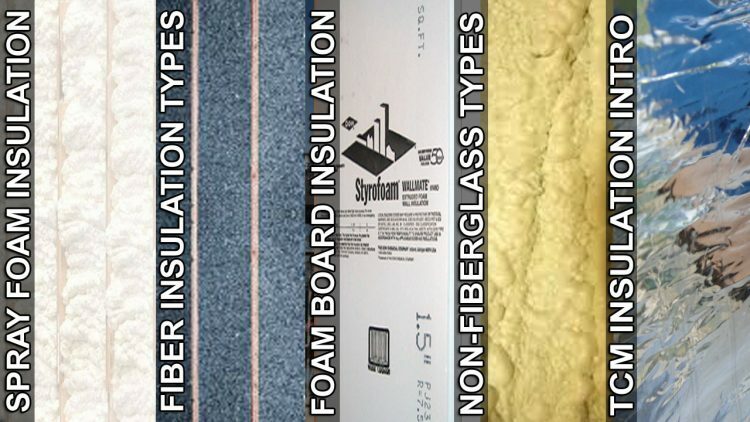 Fiberglass does have some benefits versus other types of insulation methods. Fiberglass insulation is one of the cheapest insulation methods to install and is pretty easy for just about anyone to do. Any half-way handy man can install fiberglass insulation. Although, most insulation contractors do not recommend fiberglass insulation anymore, most are turning to spray foam and foam board applications. Wool insulation is exactly as it sounds, make out of sheep wool or fibers. Many business owners and homeowners install wool to insulate their home or business. Although, wool insulation is made for colder climates, desert climates like Phoenix, Arizona call for a different type of insulation that more resistant to heat rather than keeping it all in. Wool R-Value: Wool Insulation has an R-value of 3.7-4.2 per inch. There are only 2 types of insulation that will fill all the cracks you need to fill, spray foam insulation and soy based spray foam insulation. Soy-based spray foam is actually better for installation because it fills even more tiny spaces than traditional spray foam does and is a biodegradable/renewable resource that’s also great for green construction. Open-Cell spray foam insulation is the cheapest spray foam option. It’s called open cell because the internal foam bubbles never close completely. When the foam starts to expand, the air becomes trapped in the bubbles. This creates billions of air pockets in the foam that slow heat down as it passes through the bubbles. Open-Cell R-Value: As fancy as it sounds, open-cell spray foam Insulation has an R-value of 3.5 per inch. Closed-cell is the best type of spray foam because it’s much stronger and denser than open-cell. Also it doesn’t allow air to pass through or water to be absorbed. This barrier is created by the closed bubbles that are filled with gas to make them a better insulator and smaller. Closed-Cell R-Value: Closed-cell spray foam Insulation has an R-value of 7 per inch. Expanded polystyrene is the best insulation of all three types of rigid insulation. This type of insulation is typically used for Wall, Roof and structural applications. This insulation can be treated to resist pests and doesn’t retain water. Expanded polystyrene is less likely to degrade overtime versus other types of insulation. Expanded Polystyrene R-Value: Expanded Polystyrene Insulation has an R-value of 4.6 per inch. Extruded polystyrene is recognizable mostly by their pink, green or blue colors. They take 2nd place vs other type of foam board insulation in both R-value and cost. This type of insulation is more likely to absorb moister overtime and doesn’t come with any warranties on R-value retention. Extruded Polystyrene R-Value: Extruded Polystyrene Insulation has an R-value of 5 per inch. Polyisocyanurate is commonly used in different roofing applications. Although, these panels are expensive to buy but have a higher R-value that comes with the higher price. However, these panels are not made with environmentally friendly process and cannot be recycled. Polyisocyanurate R-Value: Extruded Polystyrene Insulation has an R-value of 6.5-8 per inch. (SRX) SuperReflex is the BEST INSULATION IN THE WORLD! How can we say we say that? It’s simple, no other insulation or energy improvement contractor can offer what we Alternative Energy, LLC Does! Their products don’t work, or at least not as good as our PATENTED radiant barrier alternative product (See our radiant barrier case studies). The instant their radiant barrier material starts picking up dust, it stops working as efficiently. We solved the radiant barrier dust problem with our SRX (SuperReflex) product! It’s pretty similar to radiant barrier but far more effective, comes backed with a lifetime guarantee to at least save you 20-50% on electricity and also does the unthinkable, KEEPS EVERY ROOM IN YOUR NEW HOME THE SAME TEMPERATURE! No other AC, insulation contractor or solar energy equipment supplier can guarantee those types of savings!! Read more about our incredible new alternative radiant barrier product that is taking over the insulation industry by storm. SuperReflex R-Value: SuperReflex is an insulation all in itself, it’s not even rated with R-value. It is rated with an E Value. E-Value Stands for Emissivity of heat. R-Value stands for Resistance to heat. An easy way to think about it is using sweaters. If you wear a sweater in the cold weather that sweater has an R-Value and depending on how thick the sweater is will determine how warm you will be. In the summer, In order to block the heat however you will need something that does not retain heat at all like insulation does. The best product that does not retain any heat, it is the lowest heat “emitting” surface in the world, with an E-Value of 0.02, which is literally impossible to heat up unless you hold a flame to it, SuperReflex. The best way to insulate a new home that’s still in the construction stage, is insulating it with SRX. SRX has the lowest emissivity level on the planet (even lower than silver) and can be used for any type of residential or commercial application including: new home construction or energy efficient home construction. Are you a new home builder, construction contractor or green building expert in Phoenix, Arizona? We have revolutionary insulation products that can help your homeowners save up to 50% on their electricity bills for the rest of their homes life. This adds value to your services and allows you to charge more energy efficient construction services. Alternative Energy, LLC is an energy efficient insulation contractor that specializes in new home construction insulation installation. Our Radiant Barrier Solutions are far superior to any other insulation contractor in Phoenix and can help your team save on material costs and help homeowners save money on utility costs. Give Alternative Energy, LLC a call today for a free insulation estimate or to hear more about our patented energy products. We serve the entire Phoenix Metropolitan Area including: Phoenix, Mesa, Tempe, Scottsdale, Chandler, Gilbert, Fountain Hills, Peoria, Surprise, Sun City, Youngtown, Arizona cities.